Tennis as the modern sport can be dated to two separate roots. Between 1859 and 1865, Major Harry Gem and his friend Augurio Perera developed a game that combined elements of rackets and the Basque ball game pelota, which they played on Perera's croquet lawn in Birmingham, United Kingdom. In 1872, along with two local doctors, they founded the world's first tennis club in Leamington Spa. The Courier of July 23, 1884 recorded one of the first tennis tournaments, held in the grounds of Shrubland Hall. In December 1873, Major Walter Clopton Wingfield designed a similar game — which he called sphairistike (Greek: σφάίρίστική, meaning "skill at playing at ball"), and was soon known simply as "sticky" — for the amusement of his guests at a garden party on his estate of Nantclwyd, in Llanelidan, Wales. He based the game on the newer sport of outdoor tennis or real tennis. According to most tennis historians, modern tennis terminology also derives from this period, as Wingfield borrowed both the name and much of the French vocabulary of real tennis and applied them to his new game. The first championships at Wimbledon in London were played in 1877. In America in 1874 Mary Ewing Outerbridge, a young socialite, returned from Bermuda where she met Major Wingfield. She laid out a tennis court at the Staten Island Cricket Club in New Brighton Staten Island, New York. The exact location of the club was under what is now the Staten Island Ferry terminal. The first American National tournament in 1880 was played there. 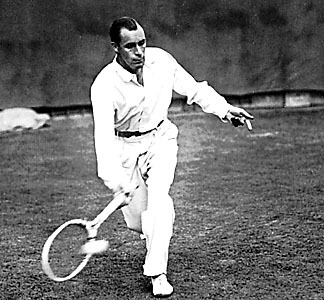 An Englishman named O.E Woodhouse won the singles match. There was also a doubles match which was won by a local pair. There were different rules at each club. The ball in Boston was larger than the one normally used in NY. On May 21, 1881, the United States National Lawn Tennis Association (now the United States Tennis Association) was formed to standardize the rules and organize competitions. The U.S. National Men's Singles Championship, now the US Open, was first held in 1881 at Newport, Rhode Island. The U.S. National Women's Singles Championships were first held in 1887. Tennis was also popular in France, where the French Open dates to 1891. 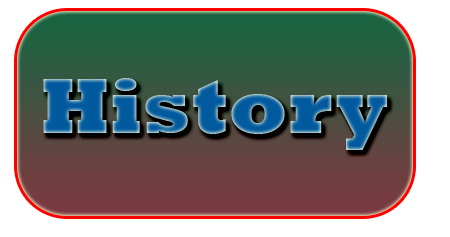 Thus, Wimbledon, the US Open, the French Open, and the Australian Open (dating to 1905) became and have remained the most prestigious events in tennis. Together these four events are called the Majors or Slams (a term borrowed from bridge rather than baseball. The c omprehensive International Lawn Tennis Federation, now known as the International Tennis Federation, rules promulgated in 1924 have remained remarkably stable in the ensuing eighty years, the one major change being the addition of the tie-break system designed by James Van Alen. That same year, tennis withdrew from the Olympics after the 1924 Games but returned 60 years later as a 21-and-under demonstration event in 1984. This reinstatement was credited by the efforts by the then ITF President Philippe Chatrier, ITF General Secretary David Gray and ITF Vice President Pablo Llorens, and support from IOC President Juan Antonio Samaranch. The success of the event was overwhelming and the IOC decided to reintroduce tennis as a full medal sport at Seoul in 1988. In 1926, promoter C.C. Pyle established the first professional tennis tour with a group of American and French tennis players playing exhibition matches to paying audiences. The most notable of these early professionals were the American Vinnie Richards and the Frenchwoman Suzanne Lenglen. Once a player turned pro he or she could not compete in the major (amateur) tournaments. In 1968, commercial pressures and rumors of some amateurs taking money under the table led to the abandonment of this distinction, inaugurating the open era, in which all players could compete in all tournaments, and top players were able to make their living from tennis. 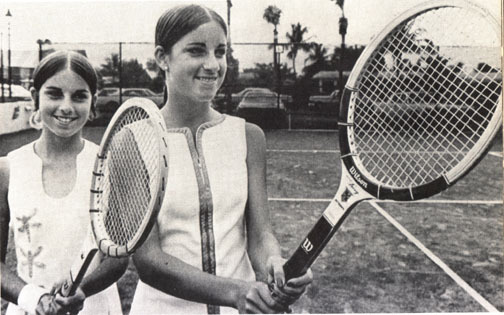 With the beginning of the open era, the establishment of an international professional tennis circuit, and revenues from the sale of television rights, tennis's popularity has spread worldwide, and the sport has shed its upper/middle-class English-speaking image (although it is acknowledged that this stereotype still exists. In 1954, Van Alen founded the International Tennis Hall of Fame, a non-profit museum in Newport, Rhode Island. The building contains a large collection of tennis memorabilia as well as a hall of fame honoring prominent members and tennis players from all over the world. Each year, a grass-court tournament and an induction ceremony honoring new Hall of Fame members are hosted on its grounds.